It appears the transfer business at the club is hotting up and Ivan Gazidis and Arsene Wenger are in for a busy week. The chief executive has been working on deals alongside the Frenchman who is apparently in France putting the finishing touches to the negotiations which would bring Lille's Gervinho to the club. 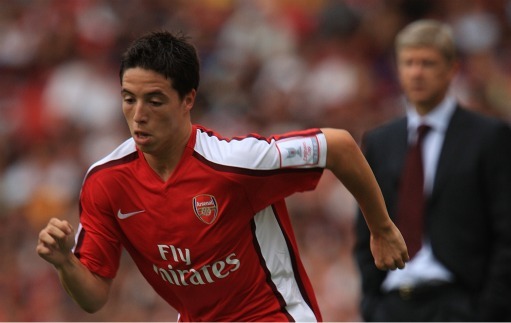 According to the Daily Express, Wenger is also set for showdown talks with Samir Nasri on his new deal. Hopefully that will play out well with the player putting pen to paper on a new deal. It seems as though the Manchester United stuff has gone quiet. I have to wonder if that Nasri's agent trying to quash any anger from us Gooners and also a bit of brinkmanship to force Arsenal to up their offer to one which is more acceptable to a player who scored ten goals and provided just one Premier League assist last season. I would love to see Nasri stay. I thought he was becoming important to the team especially in the first half of the season. He was the one who was oiling the engine of the team in the way Robert Pires used to do. The only reservation about a deal being done is that he is fighting for more cash and has all the cards in his hands. If Arsenal's offer still isn't good enough he'll be sold this summer and it won't be to another English team - Arsene Wenger won't want to strengthen a rival. Whilst in France, Wenger is also set to sit down with Ivory Coast international Gervinho. Lille have admitted that Arsenal are in advance discussions with the player but the two clubs are yet to agree a fee. You would have thought a fee would have been set prior to Arsenal entering talks with the player and his representative but no.... Lille are going to want some good money for him. Perhaps we can sweeten the deal by offering them one of our rising stars on loan next season much in the way Francis Coquelin went to Lorient after the Koscielny deal went through. For me, even if we do sign Gervinho I don't think our business when it comes to our attack will be complete. The Ivorian has spent much of the last season playing on the right hand side of attack. We have Theo Walcott who plays there. So does this mean Wenger will push the Englishman up front? If Gervinho is going to offer us back up to van Persie and Chamakh, he'll be at the African Cup of Nations in January along with the Moroccan. That will leave our squad a little bare. So for me even if Gervinho does sign we're going to need to bring in another player that is unless we've told Bendtner he's not going to be sold this summer. Cesc Fabregas is flying to Madrid today and is likely to be asked whether he wants to stay with Arsenal or move to Barcelona according to the Daily Mirror. The Catalan club would obviously like Fabregas to say something which would make it easier for them to negotiate a price which would be more to their liking than the £50m we should be demanding. And Cesc is best advised to say nothing about his future. He doesn't want to see his reputation tarnished by this saga more than it has been already. Plus it's worth remembering he'll want to be paid his loyalty bonus... and that's not loose change. The Daily Mirror say we're close to signing Christopher Samba. These rumours have been doing the rounds for the last couple of days so nothing new there. But surprisingly they say we'll go for Gary Cahill as well as the Congolese international. Another name added to our transfer radar is that of Sunderland goalkeeper Craig Gordon, a player we've been linked with before. And it's not surprising we're looking at goalkeepers. We're not going to see Jens Lehmann back at the Grove next season and Manuel Almunia must surely have played his last game for the club, so looking for good back up for Szczesny and Fabianski has got to be high on Wenger's list. Extra reading comes in the form of the full interview with Bacray Sagna as played out on French radio yesterday. The Arsenal man talks Nasri, Fabregas, Wenger, Gervinho and his own Arsenal future. And finally... it's all becoming clear why Alisher Usmanov is hovering up shares like pacman. He wants to get a look at the books according to The Guardian. That way he won't have to get insiders to pass him the information he's after.